Nine Dallas-area galleries exhibited work at the recent Dallas Art Fair – and some of it enchanted. Guest blogger Gail Sachson owns ASK ME ABOUT ART offering lectures, tours and program planning in the arts. The seventh annual Dallas Art Fair, April 10-12, was a home run for the home team. That is, for founders John Sughrue and Chris Byrne and for the nine Dallas galleries which exhibited work. They stood out above the crowded field of 90-plus galleries from all over the world. The Dallas galleries included Barry Whistler, Cris Worley, Zhulong, Talley Dunn, Valley House, Galleri Urbane, Ro2, Conduit and Kirk Hopper. Sorely missed was RE Gallery, which was a big hit in a small space last year. Sughrue and Byrne built it, and they came. They came to see and be seen, to browse, to buy and to party: art fair novices, savvy collectors and the just plain curious. (Ruinart champagne and Nespresso chocolates added to the buzz and good feelings.) Collectors were seen with their eyes glued to marked-up maps, as they strategized navigating the maze of booths in the F.I.G. building (Fashion Industry Gallery). A surprising number of young couples pushed baby strollers, and even a dog or two was spotted wandering the aisles. (The building is dog friendly). It was a friendly fair all around. Comments overheard were that visitors thought it was “one of the most genuine, friendly and open of the art fairs.” Greeting their regulars, Dallas gallerists barely had a moment to sit or enjoy a salad from the cafe. Sales and conversations were constant. Never stopping hosting at the Vallery House Gallery’s booth, Cheryl and Kevin Vogel were sustained only by the bowl of chocolates laid out for guests. They exhibited Carol Cook’s engaging and empathetic ceramic figures of convalescing adults, Gail Norfleet’s newest floral exploration, The Flowers of the Street of Spirits with acrylic, collage and cut paper — plus the engaging, enigmatic and ethereal work, Retired Siren, by Israeli artist Hadar Sobol. In particular, I loved Sobol’s delicate piece, which lured us into a corner of the booth. 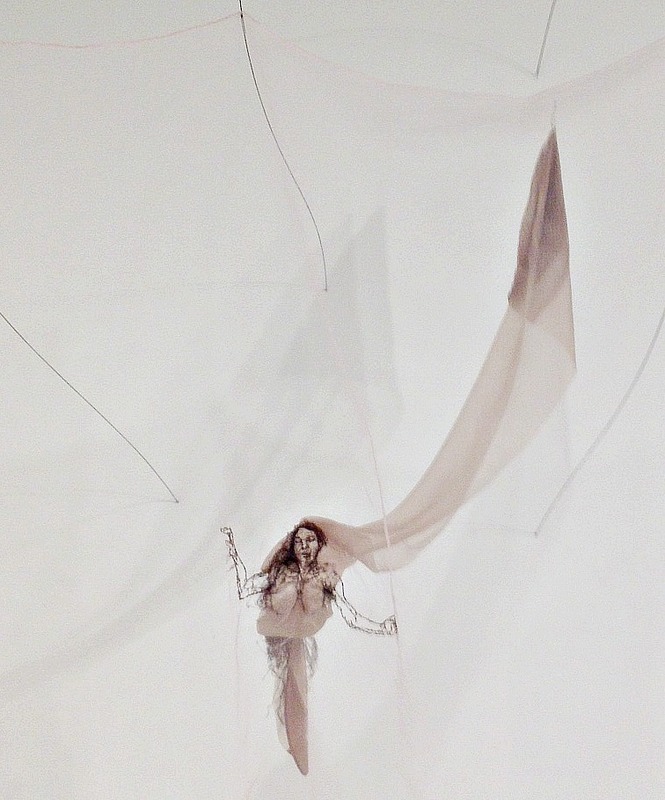 She embroidered a miniaturized floating female figure onto a vintage silk stocking. The figure, a former siren, could be a prisoner to her past, shrunken and tightly stitched to that no-longer-useful stocking. Yet although her breasts sag and her face has fallen, Sobol’s retired siren sways with the wind (and air conditioning) and still lures sailors to shore. After all, she lured a collector to take her home. Sobol’s work was one of the many wonderful works from Dallas galleries to find a home. Conduit Gallery reported two Kirk Hayes pieces sold before the Preview, and Juan Fontanive’s motorized flip boxes of birds and butterflies (below) were also extremely popular, as evidenced by the many red dots. Viewers delighted in the marriage of art and technology, mixed with childhood memories and a dash of magic.